One of the odd things about “luxury” ingredients is that, for the most part, they are hors d’oeuvres, accents, garnishes and finishing touches rather than the focal point of a meal. A shaving of truffles elevates a pasta dish, but even if you could afford to do so you probably would not sit down to eat a plate of truffles. A few slices of Spanish Jamon Iberico or just a bit of Beluga Caviar is brilliant…and, for most, enough. I can hardly conceive of how to make saffron the star of an entrée. There are exceptions, of course. Kobe Beef is certainly one. Foie Gras pops up on menus every once in a while as a main course, though it is more commonly a starter. But America’s favorite luxury ingredient – at least of the entrée variety – has to be lobster. And with a wife hailing from Boston – and a supply glut in New England — that made the focus of our 23rd Anniversary meal a rather easy choice: Homarus americanus. But having a special ingredient on a special occasion is not enough: we wanted to do something special with that special ingredient. There is exactly nothing wrong with simple steamed lobster with drawn butter. It is brilliant stuff. But these bugs – 1 ¼ pound beauties – inspired ambition. Nancy’s signature dish is risotto. She cooks it better than she cooks anything else and, in all honesty, I have tasted few risottos anywhere as good. That was something to build around. And there is no better way to cook lobster than Thomas Keller’s butter poaching technique: parboil the lobster, remove it from the shell and poach it in butter. The shells of the lobster gave birth to the stock we used in the risotto and the poaching butter enriched the snow pea sauce. Parboil the Lobsters. Bring a large pot of water to a rolling boil. Place the lobsters, head first, into the pot and cover with a lid. Cook the lobsters for 5 minutes. Remove the lobsters from the pot using long tongs. 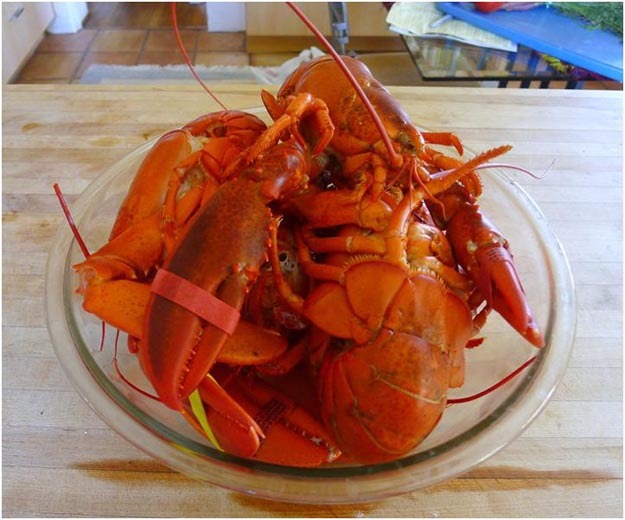 Refrigerate the lobsters to cool or simply allow them to cool on a cutting board. When the lobsters are cool enough to handle, remove all of the meat from the shell taking care to keep the tails and claws whole. To do so, snip through bottom sides of tail shells with shears and remove meat. Separate the claws from the knuckles by twisting off the knuckles, and reserve. Hold the claw, pull down on small pincer and pull it off. Using heavy shears, snip shell at knuckle end enough to open it; remove meat in one piece. Use shears to snip through the knuckle shell, pry open and remove the meat. You will use the knuckle meat for the risotto and the tail and claw meat on top of the risotto. Chop the knuckle meat into bite sized pieces. If you have enough attractive pieces of claw meat also chop any extra claws into bite sized pieces. Make the Emulsified Butter. Place 2 tablespoons water in a saucepan and bring to a boil. Reduce the heat to very low, and whisk in butter piece by piece. Continue adding until all the butter is emulsified. Set aside, and keep warm…but do not allow it to boil. Depending on how long you will need to hold the butter consider transferring it to a thermos. Make the Risotto. In a heavy, medium-sized pot, heat the olive oil over medium-high heat and saute the shallots for 2-3 minutes. Do not let them color. Add the garlic and the rice and stir well for about a minute. Add ½ cup of the white wine and bring to a boil. Let the wine boil for about one minute and then stir, continuing to stir frequently – about once every minute and a half. Allow most of the liquid to evaporate before adding another ½ cup of liquid – alternating between the white wine and the chicken stock – each time stirring, allowing most of the liquid to evaporate and then adding the new liquid. 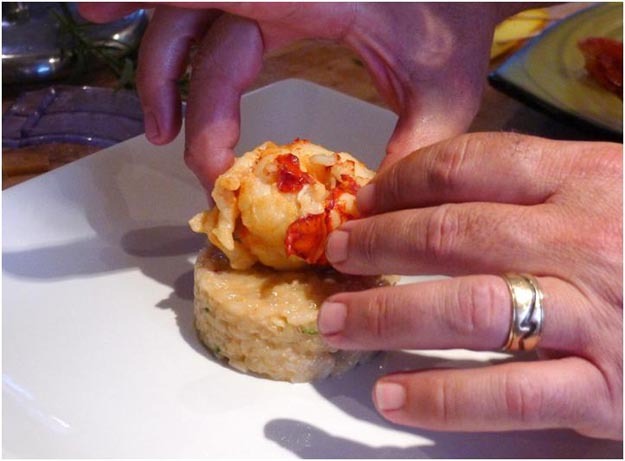 When the rice is nearly done add the chopped lobster knuckle and claw meat and the tarragon. Keep cooking until the rice is done but not mushy. The rice must remain al dente with each grain distinct but the whole dish creamy. If rice starts to get dry, add more stock, ½ cup at a time, as necessary. Season to taste with salt. 5 to 6 minutes, until meat is just heated through. Transfer the lobster pieces to a platter and cover with foil. 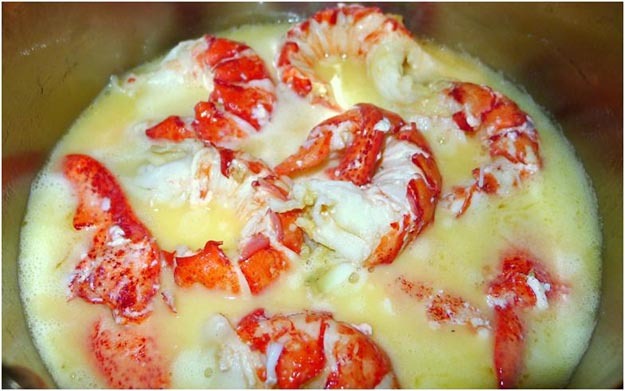 Reserve the lobster butter for use in the sauce. Make the Sauce. Par boil the snow peas in the chicken stock in a medium sized sauce pan for 3 minutes. Transfer the snow peas and the stock to the bowl of a high speed blender (such as a Vitamix) and puree to perfect smoothness. Alternatively, use an immersion blender or a food processor and strain the pureed liquid through a fine mesh strainer. Return the puree to a sauce pan and swirl in the reserved lobster butter until you reach the texture and richness you desire (about ½ cup of liquid). Add the tarragon and simmer for a minute before plating. Plate the Dish. Spoon the risotto into a ring mold. Using a wine glass, spoon or spatula compress the risotto just enough to make sure it stays in place. 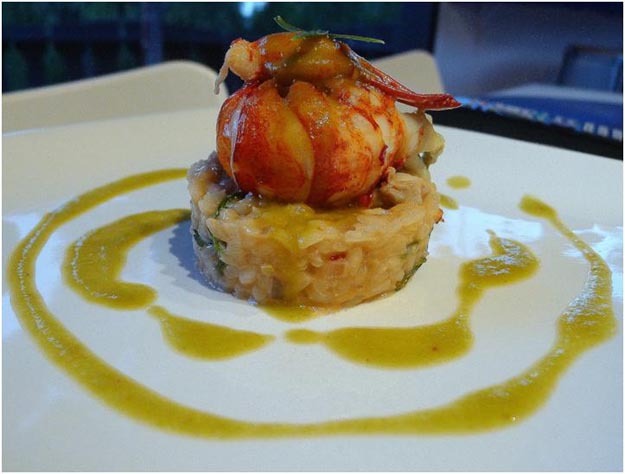 Arrange one lobster tail and one lobster claw on top of each risotto. Spoon the sauce over and around the risotto. 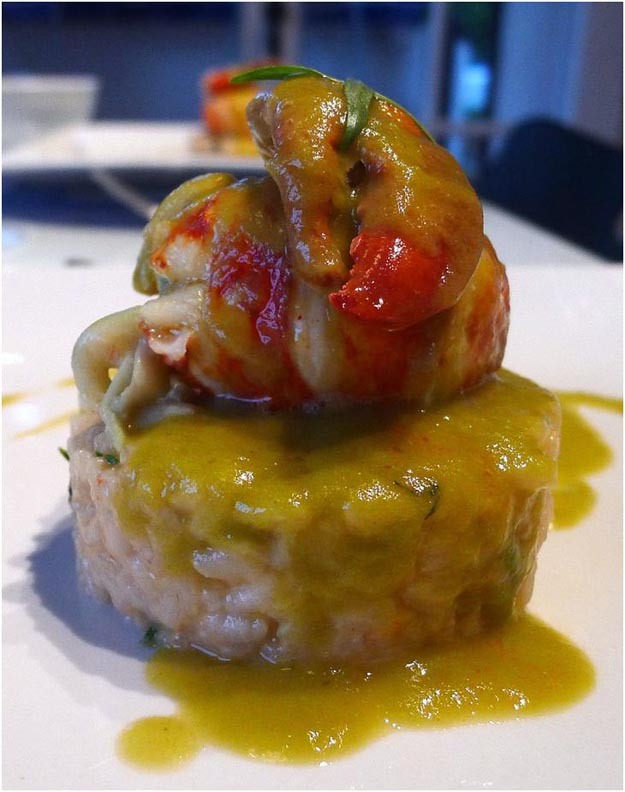 Arrange several leaves of tarragon on top of the lobster. N.B. 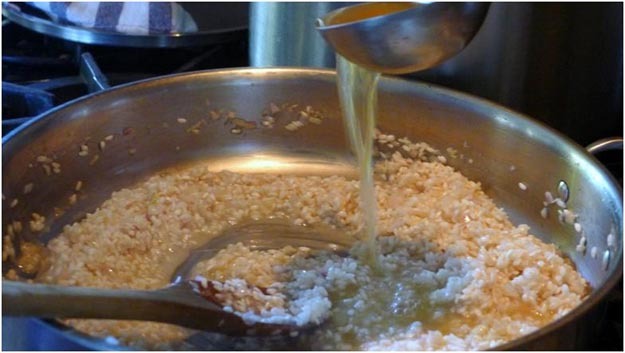 While chicken or shrimp stock – or even water – are fine for the risotto, it takes relatively little effort or time to use the shells from the lobsters in step 1, above, to make fresh lobster stock. Put the shells in a soup pot with a roughly chopped onion, carrot and celery, cover them with water, bring the pot to a boil and then simmer for ten to fifteen minutes.